Dog therapy launched as a new supportive program at Algonquin and so far it has already had a big impact on all who’ve been able to get involved with the new initiative. First reported on Jan. 4 by communications manager, Ruth Dunley, wrote about the coming therapy dog options. Already, the program has big support from students, staff and specialists alike. Dunley is a member of the Therapy Dog Committee. During a December town hall meeting executive director of communications, marketing and external relations, Scott Anderson said the idea had originally been brought up during Bell Let’s Talk. That artist is Catherine Legault with the marketing department at Algonquin.She had been approached with an offer to work on the dog therapy program. Originally it was only meant to go off of photos, but Legault explained that as a graphic designer, she decided to illustrate them. Her graphics were a hit and became the front for the advertisement of the dogs. “I just started creating up to 15 different kinds of dogs from the original pitch until the final pitch became eight dogs,” Legault said. Algonquin President Cheryl Jensen also added to the discussion on therapy dogs at the college. She assured that costs aren’t being taken out of the college funds and the program is mostly run by volunteers. “Mental health has been one of the key concerns this year,” Jensen added regarding the dogs. AC director, Tracy McDougall enjoyed her own involvement with the program along with her own golden doodle, Monte. She mentioned feeling thrilled by the opportunity. “Not only do I get a chance to participate in the program and spend some extra time with my own dog, I also get to meet students and maybe even staff…I am in my office most of the time and don’t have an opportunity to mingle with staff and students!” McDougall commented in an email. In late August the Algonquin College executive team approved the involvement of dogs in therapy for Algonquin students after months of research on the topic. Employees were also given the chance to bring in their own dogs following a few guidelines and having the dogs screened by behaviourists. Once the team was established, students would then be hired to act as Therapy Dog student ambassadors. These students are then paired with an employee and a therapy dog. Both will undergo training and the owners comfort for scheduling will be accessed. One such student ambassador is Ioanna Giannopoulls who is in the veterinary program. Through the AC job site her program coordinator mentioned how the therapy dogs were looking to hire a team. “So, because I’m already going into the profession I thought it would be great to have some experience with therapy dogs,” Giannopoulls said. The inspiration for the therapy dog committee actually came from an owner and her companion from Carleton. Shannon Noonan and Blue, a Great Dane/pointer are a part of the Carleton therapy dog program. Noonan has been working with Blue for several years on her own and is studying professional dog training. Noonan was called to consult on the dog squad. “Anyone in the community can evaluate their dog as a therapy dog. Some of the organizations like Therapeutic Paws for Canada,” Noonan said. 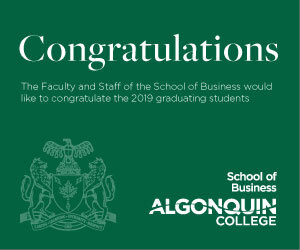 “Definitely they had a vision in mind and they changed a few times and they really made a program I think that is a well-rounded, good representation of what Algonquin needs and also what students need,” Noonan said. The new “dog squad” has selected eight dogs and their owners to join the pilot program. Each of them plays their own unique rule bringing their special characters in to liven up a room. Algonquin’s very own vice-president of innovation and strategy, Doug Wotherspoon, has also made his 10 year old chocolate lab an official part of the therapy dog program. He knows firsthand the relief a friendly companion can be after a long day. There has been some controversy, however, on the idea of having the dogs roaming the school whether with handlers or not. 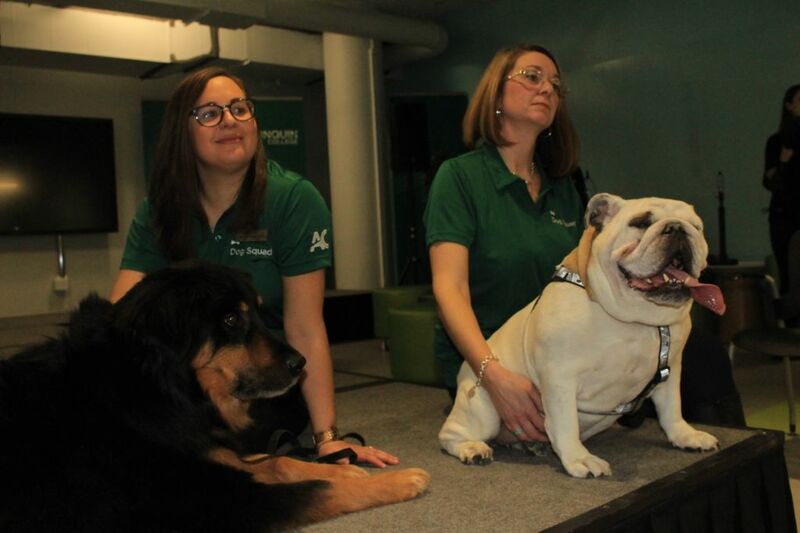 The question was raised during the last president’s town hall in December for Algonquin on the 11th, that international students might take issue with the presence of dogs. 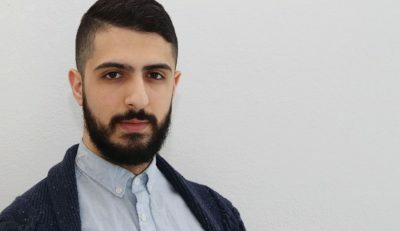 “This past year we’ve seen an increase in our international enrollments of an excessive 40, almost 45 per cent this year,” Wotherspoon said. But one woman wondered whether the implications had been properly thought through. “I completely understand the benefit of therapy dogs, I have a couple of them working around my life, but I am a little concerned be that we just finished talking about making international students feel comfortable,” she said. Some international students have a very different feeling toward dogs than the majority of the student body, saying that they may not feel as “warm and cuddly” to dogs. During the first introduction of the dogs, some international students in attendance approached the dogs warmly. These dogs will be wandering the halls with their handlers on occasion. They will be wearing specially designed green vests to distinguish them from the service dogs who should be left undisturbed. New dog therapy programs has tails wagging Reviewed by Jennifer Leblanc on January 24, 2019 .